Well I got back Tuesday night and I’m still running on Africa time. 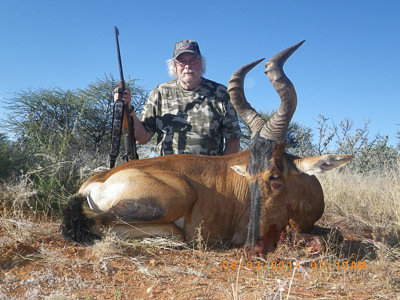 To start this was my first hunt in Namibia and I was looking for something different than a small farm RSA hunt, I was not disappointed. Shona is about 2 hours out of Outjo set in a hilly area and is owned by Johann Veldsman and his wife Vera. They are very professional in running there outfit, great food and great company. Gemsbok, we hunted for 2 before I finally had one down, there where herds of up to 140. And yes I did wound a couple of management ones we sadly lost. Hunting was done by stalking, and I need to practice off of sticks at longer ranges. Hartmans Zebra, we spotted a couple on a mountain side and did a stalk but they spotted us and left for places unknown. we then went to another area and climb a mountain and spotted 3 herds. after some talk we decide to go after a herd on anther hill so we climbed down. while climbg down we spotted a closer herd on the same hill, but one ridge closer. While stalking this herd a lone stallion was spotted about 60 meters away. we knelt down and wait for him to come out. he went down after 1 shot, I put a second shot in for insurance. Then the work began! Black Wildebeast, they are a high fence hunt in Namibia we went to a neighbouring farm, we started climbing Kopjes and glassing till we spotted a herd and stared stalking. After 45 minutes or so saw a nice one and got a shot at him, one through the chest and he went 70 yards and was down. Red Hartebeast, these are Johann’s least favourite animal to hunt, he claims they have very good hearing, eye sight and smell. Again we went to another farm north of us. pulling through the gate we spotted a cow and calf, so decided to get out and hunt from there. We spent an hour scaring animals off, they do have good senses. We then went into another field that was thick with brush and manager to stay down wind of a bull as he was feeding. It took about 20 minutes to get into position for a shot and he was down. Steenbok, I would have been better off with a shotgun and buckshot. Johann had some stuff to do so he sent me out with his other PH Jonus. we spent the morning jumping these in the tall grass. They would wait till you where close and then take off. the grass was so tall you couldn’t see them till you where right on top. We where heading in for lunch and one was just standing in the open. so after hours of jumping the it was anticlimax. Giraffes, I was offered a Management giraffe at a very good price so made aranngements to hunt one on my last day. I had to shoot a young bull. We climb kopjes and found herds and stalked many cows and trophy bulls. we couldn’t seem to find any young ones. we went to town for lunch and on the way back spotted 2 young bull that we tried to get stalk close to. As we stalked them into progressively worst terrain. We broke off the hunt when we realized that we would never get the truck into it. We then checked out another area as a last try, we didn’t think we had much of a chance. But low and behold we spotted a young bull with a herd of cows Johann and I got off the truck and had the driver slowly drive away, we walked along the truck till we got to a brushy area to hide us. We then moved closer and waited for a shot I was using my Merkel Double. I put the first shot in the lungs instead of the heart. I couldn’t get a second shot off becuase of brush. so told Johann to put a shot into it if he could. It started running after the second shot, so i fired my second one reloaded and gave chase. As I was running I tripped and the rifle went flying, I picked myself up and caught up with Johann. Just as I was going to put another round in him he stared going down. We walked up to him and he was dead. Both of our first shots where in the lungs and would have done the job, but he ran 6-800 meters. I have heard that Giraffes are a easy hunt don’t you believe it. it was a hard all day long hunt, worth every effort.